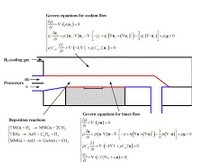 Mathematical modeling and optimal design of an MOCVD reactor for GaAs film growth_News_SiC Wafer,GaN Wafer,GaAs Wafer,Ge Wafer--XIAMEN POWERWAY ADVANCED MATERIAL CO.,LTD. This paper considers the mathematical modeling and optimal design of a horizontal metal-organic chemical vapor deposition (MOCVD) reactor for GaAs film growth. A detailed 3D model of the MOCVD reactor is developed, which includes a reaction kinetic mechanism to describe the gas-phase and surface reactions occurring in the reactor, and a comprehensive heat transfer scheme to express the heat transfer between the inner reactor wall and the outer tube cooling gas. To estimate the model parameter, a data-driven optimization scheme which incorporates a uniform design technique, a neural network auxiliary model and a real-coded genetic algorithm is developed. The proposed 3D MOCVD model is shown to be in a good agreement with experimental data and presents an excellent ability in predicting the GaAs film growth rate and uniformity. Besides, the comprehensive model enables the systematic investigation of the microscopic transfer phenomena and reaction dynamics that relate to the dimensionless groups such as the Reynolds number (Re), Prandtl number, Peclet number (Pe) and Grashof number (Gr). We found that the “cold finger” and buoyancy-driven transverse rolls can occur in the AIX 200/4 horizontal MOCVD reactor when Pe ≥ 20 and Gr/Re2 ≥ 4000. To improve the film growth performance and meet the high-quality demands, we further apply the proposed data-driven optimization scheme to search for a set of operating conditions that optimizes the film growth rate distribution and uniformity on the substrate. The optimized results indicate that a significantly better GaAs film growth performance can be achieved for the horizontal MOCVD reactor based on using the comprehensive 3D mathematical model and the proposed data-driven optimization scheme. • A novel 3D MOCVD model is developed to predict the thin film growth. • A comprehensive heat transfer scheme for inner reactor wall is introduced. • Sensitivity and stability analysis of key operating factors is investigated. • A data-driven optimization scheme is proposed to optimize the MOCVD process. • The behaviors of cold finger and buoyancy-driven transverse rolls are discovered and avoided by the design. Fig. 1. Governing equations of the proposed 3D model.